I’ve been into fountain pens and fountain pen inks for over a year now. And well, Japan is quite a huge maker of fountain pens and inks. 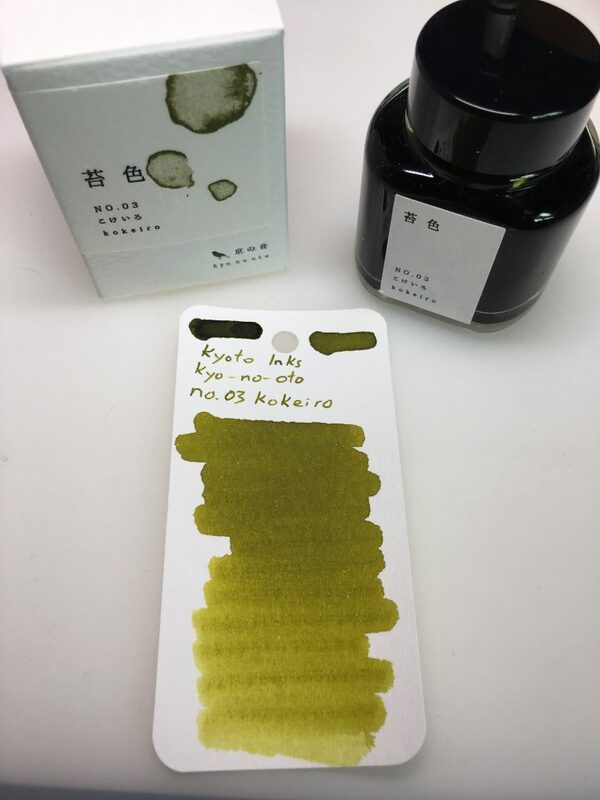 Recently, a brand of inks from Kyoto, appropriately called Kyoto Ink have been making the rounds internationally. I got a few bottles of them, and thought I’d rather this one with you. With a slant on learning Japanese of course! So this ink is from the Kyo-no-oto (京の音) series, meaning “Sounds of Kyoto”. The ink is called Kokeiro (苔色), which translates to ‘moss color’. The color is an interesting mix of yellow, green and black. The presence of the dark, black pigment is great, it darkens the overall ink color and increases the legibility. Without it, a yellow green ink might be too pale for regular usage. It certainly looks like a good representation of ‘moss color’ to me! I got the ink because of the lovely color, and was then fascinated by the naming and decided to share it here. I’ve been asked time and time again: How do you remember your kanji? Short answer: Practice. Loads of practice. Write, write and write more. Where possible, write a phrase rather than a single kanji. Some kanji are on it’s own. Like 苔, it’s a noun on it’s own, and not often used with other words. That’s fine. But if I were trying to learn 予 for example, instead of writing that single kanji, it’s better to learn a phrase together like 予約, 予定 and so on. It’s also a good idea to search the dictionary for example sentences to see how the word is used. The second method is what I’ll be elaborating on today. Breaking up the word into radicals, or other smaller components. Radicals are often really helpful in giving you an idea of what the word might be. That said, as words get more difficult and concepts become more abstract, that sort of extrapolation no longer works. Still, it’s not completely useless! See that part at the top? Yes this. That’s the ‘kusa’ or grass radical. It indicate vegetation, and that’s totally right in this case! Moss is a kind of vegetation! As for the rest of the kanji? Breaking it up into smaller parts can help you remember how to write the word… Or how to tackle writing that kanji in the first place. The middle section looks familiar doesn’t it? That’s right! It’s a ム (mu) katakana. And the bottom part is the kanji 口 (kuchi). So the next time you see a difficult kanji that you can’t write… Don’t panic! Break it up into smaller pieces and tackle it one small bite at a time!